Jordan Brand will be celebrating Michael Jordan’s Gatorade “Be Like Mike” commercial by releasing two inspired Air Jordan 6 colorways. 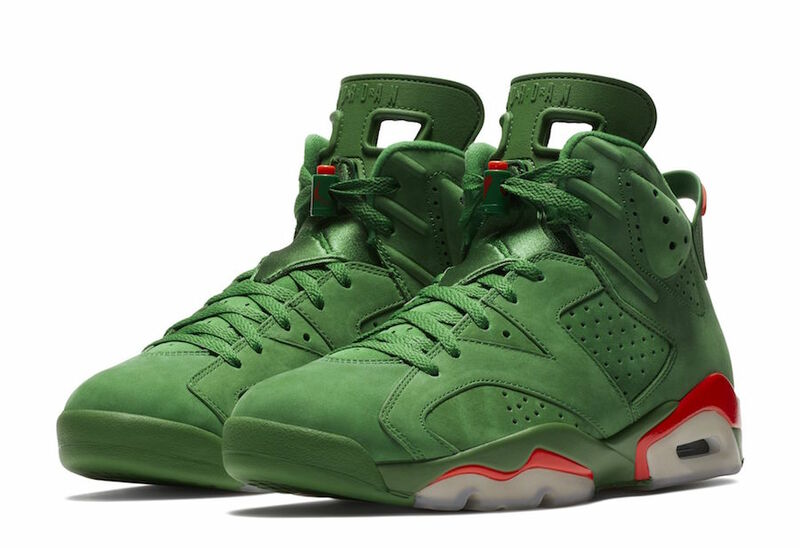 One pair comes dressed in a Carmine-like color scheme mixing White/Orange-Green, while the other pair in Green Suede (shown here) appears to be a limited release. We first spotted a sample of the “Green Suede” pair featuring a White midsole. Now, it looks like they’ve decided to remove the White midsole and replace with with Green to match the shoe’s entire upper. Other details include Orange accents, Gatorade-inspired lace-locks, translucent outsole, “If I Could Be” inner tongues and branded insoles. Completing the theme is a special Gatorade packaging with “Like Mike” logos. While the White/Orange pair is set to release on December 16th, the Air Jordan 6 Gatorade Green Suede will release on December 30th. The retail price tag is set at $225 USD. UPDATE: Nike releases official photos of the “Green Suede” Gatorade Air Jordan 6. UPDATE: Jordan Brand completes their “Like Mike” campaign with the debut of the Air Jordan 6 “Gatorade” in Green that releases on December 30th. Check out the latest product photos via Shoe Palace. UPDATE: Detailed look and video review of the Air Jordan 6 “Gatorade” in Pine Green Suede via FineLine1721. UPDATE: A look at the “Like Mike” packaging for the Air Jordan 6 Gatorade in Green Suede scheduled for December 30th. Photos via thegovernor2290. UPDATE: New photos of the limited Air Jordan 6 “Gatorade” in Green Suede via s.sam.group. UPDATE: According to zsneakerheadz, the Air Jordan 6 “Gatorade” in Green Suede is listed to be an extremely limited release. A date has yet to be revealed, but the price tag is set at $225 USD.